Note: I have updated this build to meet the challenges for 2.6.0. Changes were made to the Skill trees for Level 60 (with 4 ascendancy points) and Level 90. Besides that, there isn't much changes that need to be made for now. Using Nuro's Harp unique bow to deal a shattering amount of Cold Damage through multiple Ranged Attack Totems firing Ice Shots AKA "Popsicle Sticks". Build idea is to use things that most players don't use (causes it to be undervalued) and go anywhere near current meta builds. I know some will say a totemer is meta but please show me a recently famous ranged attack totem build. This build shines especially after the 2.5.0 patch notes that buffed Nuro's Harp to have an additional property "40% increased effect of Chilled Ground" and also the overall Totem buff with more life, resist and improved nodes in the passive skill tree. High cold penetration and Frostbite results in most enemies having zero to negative cold resist. Scion is chosen as it has an easy reach between totem nodes and weapon elemental nodes that is key to helping this build scale its damage. Deadeye is chosen first to grant an additional arrow (coupled with a corrupted +1 arrow quiver to get a total of 3 arrows, there is no need for LMP or GMP support), Farshot to compensate some of the damage lost due to Point Blank keystone and some free piercing chance never hurts. Assassin is the second ascendancy for the primary reason of getting Maims on crits. As Nuro's Harp is a harbinger bow with good base crit, this build crits fairly often which causes most monsters to suffer Chill (-30% overall speed) & Maim (-30% movement speed) resulting is very slow moving monsters. The extra 1% and also more crit multiplier to full life monsters greatly increases freeze duration (if it crits) on first hit. Slayer seems interesting for more damage against rares and bosses but offers nothing much else. Elementalist and Inquisitor gives a damage boost but not by much and can be easily obtained with a good rare jewel. ● Non-meta build - Nuro's Harp & Ranged Attack Totem? ● Good damage and clear speed - about 60k - 70k DPS with 3 Popsicle Sticks at Point Blank. A must for this build as there is nothing else that packs this much "ice" in a bow. A must in my opinion as it let's the Scion have up to 3 Popsicle Sticks active at a time (not taking into account the Hierophant ascendancy for Scion). One can do without this quiver in place of a quiver with high Weapon Elemental Damage and Max Life, but after some testing, 2 totems lacks the clear speed and the lost of a potential 1/3 of total damage output is not worth it. End game would be to get a corrupted Skirmish with +1 Arrow. This new unique item from Breach League is the finishing touch to this build which adds just the right amount of flavor. Having 100% chill means anything the Popsicle Sticks shoot at will get slowed, blinded and the subsequent shot will cut through 20% of its cold resist. On Standard, a good WED & Crit amulet will work quite well too. Jewels that bring this build to the next level! Static Electricity Unique Jewel place on the Jewel slot between Scion, Ranger and Duelist grants a crazy amount of flat Lightning Damage (up to 40 Lightning damage). Even though this build is mostly trying to do cold damage, there is only so much cold damage this game has to offer so Static Electricity provides a good source of Lightning Damage which scales very well with this build. Omen on the Winds introduced in 2.6 gives an insane boost to this already great build. Increased damage against chilled (which is 100% for this build), bigger Ice shot cones and 100% (2 jewels) piercing is too good not to include in this build. I would suggest running 2 of these jewels for always pierce and up to 40% increased damage. You can of course run one of these for up to 80% pierce (30% from Scion's Ranger ascendancy). ● Ancestral Bond (Only taken at level 68) is key to hit 3 Popsicle Sticks. ● Point Blank (Only taken at level 68) provides 50% damage if the enemy is in front of the Popsicle Sticks which kinda means always as you will be dropping it in the enemies faces, force feeding them some tasty Popsicle. Recommended: Instant Life Flask x2, Atziri's Promise, Granite/Basalt Flask and Quicksilver. Note: Anti Bleed, Anti Freeze and Anti Curse on any of the non-unique flask. I have yet to test this build with Frost Bombs but it should be quite effective to help reducing boss cold resist significantly. Use Split Shot, get your hands on a Doomfletch and you should get through Normal in no time. Make sure to get a Lioneye's Paw too for the fire damage and movement speed. For everything else, level as you would normally as an archer. Time to upgrade to a decent level appropriate bow with elemental damage or get a Doomfletch Prism. Make sure to keep your life at least around 2000s and with acceptable resistance, you should level smoothly into Merciless. Doomfletch Prism remains as it can carry you all the way to level 68 when you transition into Nuro's Harp and Ancestral Bond. Try to get your hands on a Lioneye's Vision at level 59 as it would grant you some sort of a free 5link for a low price. I used a 4 link Lioneye's Vision all the way until I got a 6link body armor. Your goal would be to get as much life and elemental resist on your rare gear as all the uniques used does not provide any life and barely any resist. Sorry for the funky video quality as I recorded it on 2k resolution on my outdated 280x GPU (using a 4k monitor) and also the mouse position is off, need to find out why. Will upload higher tier once I reach there. I think this build is fairly adjustable to fit other playstyles. Some options that I can think of or have tested. Frostbite, Elemental Weakness and Temporal Chains would increase freeze time and cause enemies to have high negative cold resist. Just swap in a Windscream or Doedre's Damning and adjust stats on other gear accordingly, but overall life would surely drop. Not taking Fangs of Frost on passive tree and changing the bow to another high elemental damage bow means that it can also be turned into a Voltaxic Totemer or MF Windripper Totemer. If a 6link Nuro's Harp is available, a Kaom's Heart can be swapped in and taking more life nodes (Purity of Flesh wheel, Golem's Blood wheel), easily bringing this totem build well over 6k life. With the changes to the passive tree, especially near the Ranger side which saw a lot of Weapon Elemental Damage (WED) nodes being added, the overall damage outcome of this build should increase significantly in 2.6.0. I will make adjustments as the league goes but so far, the changes to the tree and new unique changes, this build will definitely shine and go far into red maps. Thanks for checking out my build and hope you enjoyed it. When do you get access to the second totem? What I did was equip a Skirmish right before I attempted Cruel Lab at the end of Act 4, Cruel. 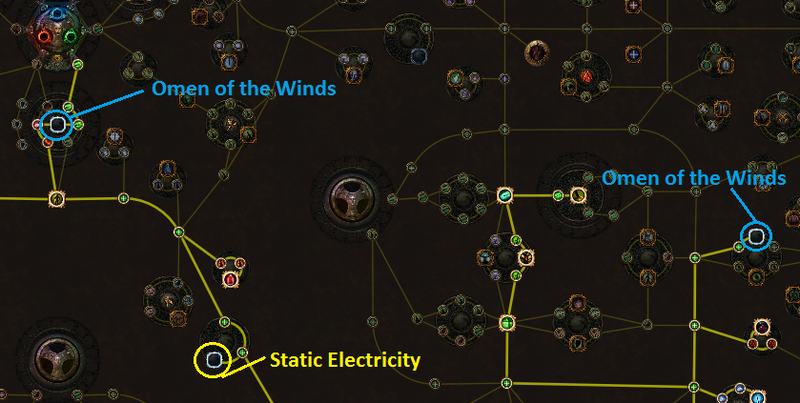 With 2 totems you can easily coast your way to level 68 where you take Ancestral Bond. You can take Ancestral Bond earlier or wear Skirmish (by level 19), but clearing things and leveling up on your own seems much faster with a decent bow and quiver imo. passive skill tree lv40 should be lv50? If you don't mind a total noob asking a dumb question, why take the bow skill point passives with ancestral bond? Does it give the crit chance to the totems when socketed into the bow or give damage to those skeletons? Your gear setup doesn't even have the totem gems socketed into the bow. I thought maybe just for leveling but you have them in your final tree. Insight into what I don't understand would be great as I started this build and can't seem to justify the bow passives to myself. All questions are a good question, have no fear. 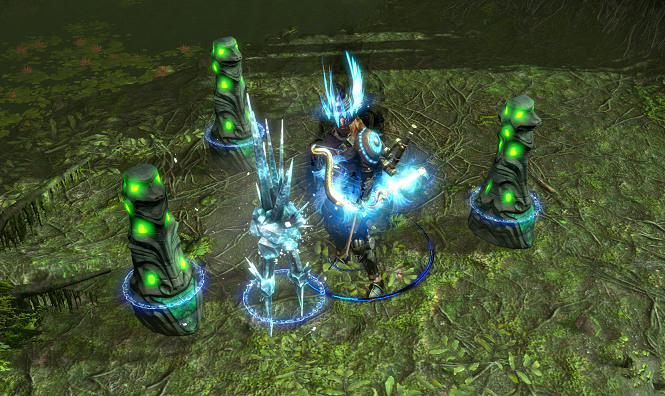 Totems are an extension of the player with all passives and stats that affect the player, affecting the totem too. Only the totem passives and stats will affect the totem alone and not the player. Gems can be socketed in any gear to grant the player the ability to use that skill as long as the player meets the requirements to use the skill granted by the gem. Bow passives taken early on helps greatly with leveling as this build should level as an archer all the way up to level 68. Only then should the build move into Ancestral Bond, triple Popsicle maker. So spec out of the bow passives after bond? I guess im just not understanding beyond leveling because you have you bow crit in your final level 90 passive tree which seems to me to be doing your character no good. Could it not be improved by savinng respec points for something else after bond? Do the bow passives provide anything after you take ancestral bond? I believe that since Ice Shot is listed as a Bow ability, passives will apply.